We are seeking historic background, ‘foot notes”, memories, comments and stories about West Norwalk’s past. We will scan your documents and photos for free. If you would like support the Historical section, please contact the Board and let us know your interest. You can also visit the Norwalk Historical Society website. Although it doesn’t focus specifically on West Norwalk, it does have some interesting information about our area. We learned in grade school that The President of The United States resides in The White House, yet many of us do not know why it is white. During The war of 1812, the British burned The White House in 1814, when it was pink. White wash was used to refurbish the home of our country’s leader. Truth be told, the British were merely retaliating for Americans burning their North American capital, Montreal. 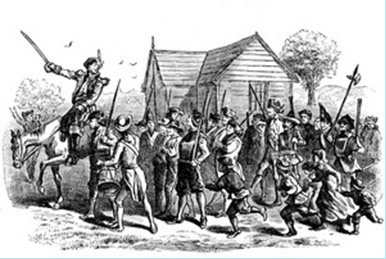 This vendetta actually began in The Battle of Norwalk 35 years earlier. Exactly 238 years ago to this day, July 11, 1779, The Battle of Norwalk became the largest Revolutionary War battle in Connecticut. Norwalk was attacked because it was a base for Patriot espionage missions, munitions manufacturing, and a supply depot. An American spy, Nathan Hale, set out from Norwalk in 1776 on his ill-fated intelligence-gathering mission at age sixteen. In November, 1778 a flotilla of twenty Norwalk whaleboats slipped past British warships and took sixteen Tories prisoners, while killing several more loyalists. Twenty six hundred British and Hessian troops landed at Calf’s Pasture Beach at approximately 5:00 pm on July 10, 1779. The following day at dawn, General Tyron marched his troops on what is now East Avenue. Brigadier-General George Garth landed his troops with a two-prong attack on what is today The Maritime Aquarium. The American Commander, George Washington, keenly aware of this attack, sent reinforcements to Norwalk’s brave 800 militia and Continental Army troops. The first skirmish was at the present-day intersection of Washington and Water Streets. It is here that The British set ablaze their first of 130 homes, (including my own home,) 40 shops, ten barns, five ships, and two churches. Only six homes were spared, – all belonging to The Loyalists. A second significant skirmish took place around Flax Hill Road. Here The British were surrounded and shot at from all sides. Eventually, the British brought in a cannon and prevailed. They marched down West Avenue and Wall Street, burning more homes and shops as they went. 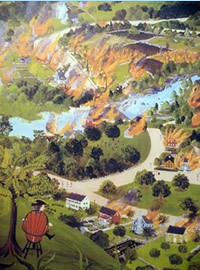 British Commander Tyron was said to sit in a rocking chair atop Grumman Hill to observe Norwalk go up in flames. As the British forces reached The Town Green, they encountered heavy American resistance forces that had an artillery and terrain advantage. The battle turned into a stalemate. With Continental reinforcements on the way, the British returned to their ships as Norwalk was reduced to ashes. With all due respect to our future first President and our local historians; I do not believe that Norwalk was “destroyed” nor was The Battle of Norwalk a “stalemate.” History has taught us on numerous occasions that resilient people are capable of rebuilding their communities under the most adverse conditions. The bottom line is that the British had no choice but to retreat to Long Island. Pulitzer-prize winning author Frances Fitzgerald’s Fire in the Lake and Sun Tzu’s The Art of War both note that for in guerrilla warfare to defeat a larger, highly financed and experienced enemy, they simply must not lose. Their objective is to harass, bleed, demoralize, and wear down the enemy. George Washington was keenly aware of this crucial military concept without reading either author. This was the essence of his greatness. The Battle of Norwalk was a microcosm of The Revolutionary War. Brave Norwalk citizen soldiers, outnumbered by more than three to one, imposed their will and did not allow The British Army to defeat them! Cannon Street, Flax Hill Road as well as other homes in Norwalk. 2) Onesimus Comstock, the last slave in Connecticut, is said to have diverted British troops away from the battle. He then observed the destruction from the area which is now The Silvermine Golf Club. 3) The Hessians mistakenly burnt down The Church of England on East Avenue due to language communication difficulties with the British troops. 4) It was Former Norwalk, Connecticut citizens who accepted government compensation grants for destroyed property after the war who settled Norwalk, Ohio. 6) The term “son of a gun” was given to babies born “between the cannons” on warships during the American Revolution. 7) One third of The American Navy during the war was African-American.